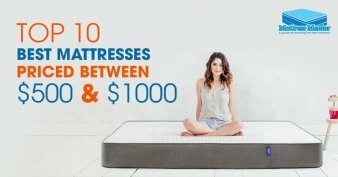 Buyers often spend a lot of time deciding on the perfect mattress, then wonder why they still ache when they get up, or feel tired even after sleeping all night. The answer is simple, your pillow has as much, and sometimes even more, influence on how well your body can relax while you sleep, and can either aggravate or relieve muscle tension. The principle factor used to create a luxurious, yet supportive cushion for your head and neck is the shredded memory foam stuffing material. Inside this pillow are pieces of memory foam. 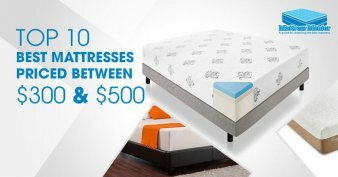 These pieces have many helpful facets that make them superior to a solid piece of memory foam. The foam pieces let you position the pillow exactly the way you want it, wrapping it around areas of your body, or turning it around your shoulders. One additional feature that might be overlooked, but is just as important as the inside of this pillow is the bamboo fabric cover. 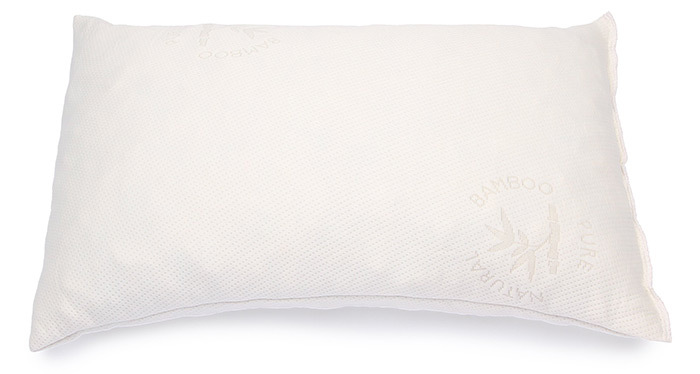 The pillow casing is made of 50% polyester and 50% bamboo for a durable and soothing sleep surface. Bamboo is resistant to high temperatures or body heat. The material is porous so it can breathe and let hot air escape easier than other fabrics. Bamboo absorbs moisture to help keep you dry, while also using its natural anti-bacterial agents to keep the pillow smelling great. Bamboo blends are luxurious fabrics that give you the feel of silk that is more durable than other luxury fabrics. Plush Support that is Perfect for Side Sleepers: The thick, plush support of this heavy-duty pillow is great for side and stomach sleepers. Side sleepers, in particular, have a hard time finding a pillow that can truly support their neck and shoulders. 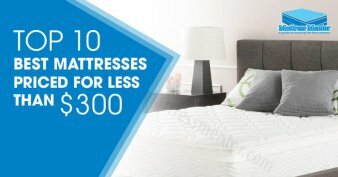 The Good Life Essentials Memory Foam Pillow lets you sleep without worry and wake up feeling pain free. Large Size for Easy Body Conforming: This pillow is available in 3 sizes (standard, queen and king), but each one is a very large and generous pillow for its category. The extra large pillow lets you use it to support your back, stomach or sides while sleeping as well as for a head/neck pillow. Thorough 5 Year Warranty: Good Life Essentials provides a very generous 5 year warranty for your satisfaction. If, for any reason, mechanical or simple preference, you are not satisfied you can get your money back. Has a Learning Curve: Few pillows can be said to require education, but shredded memory foam pillows are not something many people know enough about to begin using them immediately. The educational needs are not difficult, but it is important for users to understand there will be things they need to know, so they do not jump to conclusions.For instance, these pillows may have an odor when they are first unpacked. That can be an immediate turn off to people who do not know this is normal and that they pillows need a few hours to air out. I’ll never buy another pillow. Incredibly comfortable and really does stay cool. No more headaches or sore back after using the Shredded Memory Foam Pillow. I’ll never go back to a plain old pillow again. This pillow is machine washable for easy care. In between washings you can also vacuum the surface of the pillow to remove common debris such as hair or dust and keep it cleaner between washings. Even though it can be tossed into a washing machine, it is better to use that as a last resort, or for yearly cleaning as much as possible. It can take a long time to dry a shredded memory foam pillow, so spot cleaning as needed is a better alternative to a full washing. After washing the memory foam pillow, make sure you dry it on “tumble dry” only if you want to use the drier. A better method is to let it air dry in a well-ventilated room, or gently dry it on the lowest setting of a hair drier. 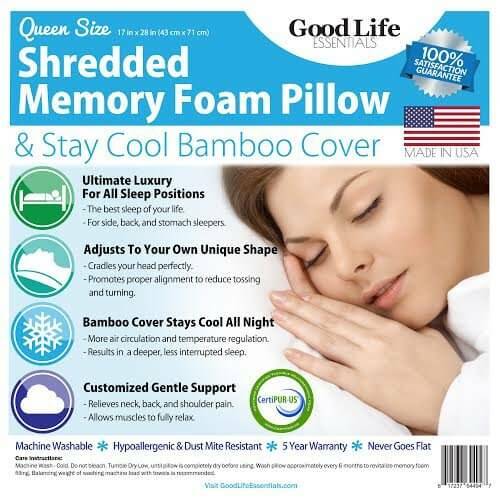 The Shredded Memory Foam Pillow by Good Life Essentials is a fabulous pillow that will help reduce morning stiffness and eliminate pinched nerves from bad sleep positions. The luxurious and soft bamboo cover is great for breathing and makes you feel like you are sleeping in a 5 star hotel. Pick up one of these great pillows today and sleep better tonight.